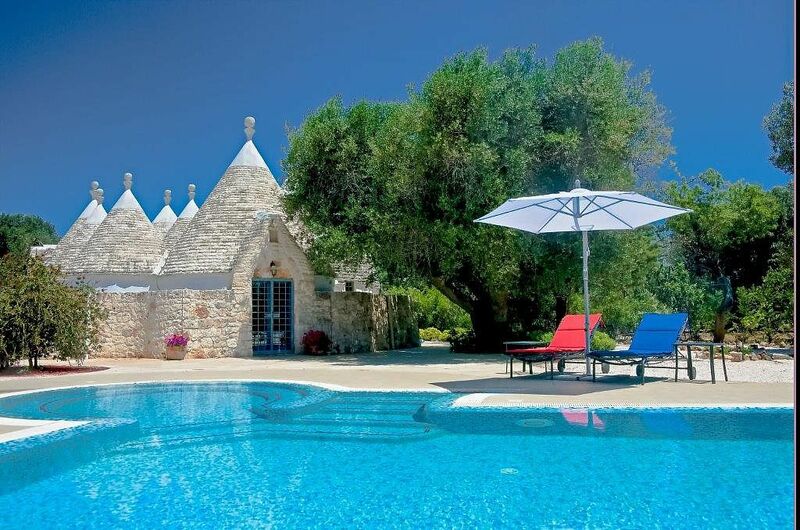 Extremely stylish, private and spaciously 12 cone 200 Year old Trullo. Fully Air-conditioned, WiFi, Completely restored by its Irish owners, with local stone masons in traditional stone method's roofs and walls up to 3ft6 thick, no expense spared, oasis of tranquility surrounded by Mediterranean grounds, 4.5 acres of olive groves and vineyard to explore. The land is dotted with plum, pear, apple, lemon, cherry, almond and fig trees different seasons. Local towns are 'very' Italian, Good markets and good shopping, local food and restaurants are great, manageress will meet and greet and look after your needs. Welcome food pack provided. No light pollution, so the stars at night are amazing, for the midnight swim! Local Manageress will look after you, Meet greet , any problems or advice, emergencies etc on call 24/7. Hi Spec Alarm monitored by Security Co.
We ended up here by luck, chance, destiny, fate !! We love the area because it is private, quiet, peaceful, safe, tranquil, and the neighbours are good. Our restoration is unique. There is easy access to all the hustle and bustle of the local towns and the best beach's in Italy. Food and Wine and the local restaurants, the markets, its deep down Real Italy. Statistics for Puglia show 350,000 foreign visitors last year, 1,650,000 Italian visitors. WiFi - Leather sofa/bed in alcove, seats, coffee table, 42 inch flat screen TV, CD player and satellite TV, NEW PS3 + some games, old XBOX +games, book case, big dresser. Think 2 hours away in the winter - haven't tried it yet !! Golf course in Brindisi - 40 mins. Wheelchair accessible all around the house, the driveway is graveled. Notes on accommodation: Pool is really cool. Fully lit at night underwater lights -I haven't seen one as good - mosaic tiled, infinity edge, all edges have been rounded no sharp edges, kids area 3 mtr/10foot circle 0.6 / 2ft deep, pool area 1 mtr 3ft3 for small kids to 2 mtrs adults jump in. Area fully lit at night total length 50 foot x 17 foot. Kids should always be supervised in pools, if in doubt arm bands on all the time. We have equipment for Kids , Cots, High chairs, Bed gates for sides, sterilizer, foods processor, ice cream maker !! - there is some toys down there please ask , also PS3 with games Xbox with games, Every room has air con, Big new Stainless steel BBQ, Hi Spec alarm which is monitored by a security company , we installed this for the periods when the house is unoccupied, if you set the alarm off the security car will be around in 10 mins! Outside: Gas BBQ, EMU high quality outside furniture, 8 pool loungers, pool 8 seater table, outside breakfast table 4 seats, BBQ, 4.5 acres of 200 year old olive trees, fruit trees seasonal, fig, cherry, plum, apple, lemon, line, amonds, capers, you are free to pick what you want - prickle pear cactus has to be handled very carefully, we also have a small vineyard. please note: Different trees come in and out of season at different times. We have an old stables and farm outhouses which we do not use Utility Room: Kitchen has good quality equiptment. Pizza oven not useable at the moment. Cleaning / Towels / Linen / Maid service: Cleaner per week rental. Linen, towels and pool towels provided, more if you want it, Please ask Other: Alcove with small bed/daybed - suit kids. another alcove with setee bed Gas BBQ outside. Everything was perfect. The property the help/advise the area......everything! Beautiful villa in lovely peaceful area,yet close enough to charming towns to visit. We enjoyed a wonderful week at this beautiful trullo, the weather was glorious and so the grandchildren made the most of the pool. Inside stays nice and cool, so you hardly need the air conditioning. A peaceful place you can really relax, but also some lovely places to visit nearby for coffee, lunch or dinner. Marina met us and took us to the villa and was very helpful with local information. Good central location. Lovely olive grove setting. Trulli was unique and beautiful with everything we needed. Teenage children loved pool even in October. Great Welcome book very helpful and nice little welcome pack. Marina the manageress & her husband, very accommodating. Thank you. A beautifully restored Trullo with a fantastic pool and outdoor area. We had a wonderful stay at Trulli Porta Blu. The Trulli is very comfortable and well equipped and the pool area is delightful, full of character with the massive old olive tree providing welcome shade. The Trulli is in its own private grounds within open countryside, with other dwellings dotted around but not overlooking the property. The nearest town/shops are a few miles away. It is well looked after with a very obliging English speaking manager, Marina. The pool and garden are regularly maintained and the Trulli was immaculately clean. There are so many interesting places to visit in the surrounding area, enough to fill three weeks if you wanted. You will fall in love with this place and the friendly locals. Puglia is a beautiful region with excellent local restaurants, medieval towns and three UNESCO World Heritage Sites of Matera, Alberobello and Castel del Monte. Some of the best beaches in Italy are within driving distance with sandy or rocky beaches, caves, grottos and scenic drives. There are multiple Lido beaches with good serviced facilities in the summer including parking, sunloungers, restaurants and toilets. Restaurant 20 minutes walk (opening times may vary according to season). better to drive unlit road no one around. San Michelle Salentino 2km Small town, restaurants, bakery. Ceglie Messapica (bakery, supermarkets, Michelin* restaurants) 5km. Ostuni –2km bakery, supermarkets, restaurants). Cisternino 20km. Beaches 20km. Booking Notes: Credit card bookings accepted. 25% on booking - balance asap. Deposit 300 euro, you pay for, gas and electricity used over the allowance of 50 euro per week . Credit Card can be taken over the phone in advance if it is more convenient. Changeover Day: Saturday in high season. departure time, before 10 am , arrival time after 4pm this allows cleaners, gardener, pool-man, and any repairs and maintenance to be done. Notes on prices: Long winter lets - call for price. November - April rental by the month for a few months possible.